The European Southern Observatory's Very Large Telescope (VLT)has a new instrument installed today that will help in observing distant galaxies. The Multi Unit Spectroscopic Explorer will help astronomers view far away objects such as galaxies and determine its properties such as mass and chemical composition. It can also capture images of these objects in high resolution 3D. MUSE is an instrument that measures properties of light such as wavelengths and intensities and combines it with high resolution imaging. By using a technique called integral field spectroscopy, MUSE can study the properties of different parts of an object, measure its mass, and observe its rotation at the same time. With the advanced technology of MUSE in terms of sensitivity, efficiency and resolution, resulting images and data are far ahead of previous spectroscopic imaging. With MUSE, astronomers can can move through the data and study different views of an object at different wavelengths, just like tuning a television to different channels at different frequencies. 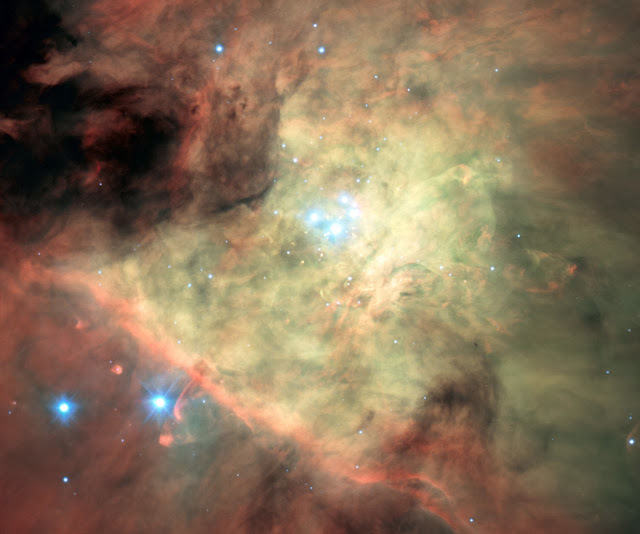 This image above is of the Orion Nebula as imaged by MUSE early this year. A new innovative instrument called MUSE (Multi Unit Spectroscopic Explorer) has been successfully installed on ESO’s Very Large Telescope (VLT) at the Paranal Observatory in northern Chile. MUSE has observed distant galaxies, bright stars and other test targets during the first period of very successful observations. Following testing and preliminary acceptance in Europe in September 2013, MUSE was shipped to ESO’s Paranal Observatory in Chile. It was reassembled at the base camp before being carefully transported to its new home at the VLT, where it is now installed on Unit Telescope 4. MUSE is the latest of the second generation instruments for the VLT (the first two were X-shooter and KMOS and the next, SPHERE, will follow shortly). MUSE’s science goals include delving into the early epochs of the Universe to probe the mechanisms of galaxy formation and studying both the motions of material in nearby galaxies and their chemical properties. It will have many other applications, ranging all the way from studies of the planets and satellites in the Solar System, through the properties of star-forming regions in the Milky Way and out to the distant Universe. As a unique and powerful tool for discovery MUSE uses 24 spectrographs to separate light into its component colours to create both images and spectra of selected regions of the sky. It creates 3D views of the Universe with a spectrum for each pixel as the third dimension . During the subsequent analysis the astronomer can move through the data and study different views of the object at different wavelengths, just like tuning a television to different channels at different frequencies. MUSE couples the discovery potential of an imaging device with the measuring capabilities of a spectrograph, while taking advantage of the much better image sharpness provided by adaptive optics. The instrument is mounted on Unit Telescope 4 of the VLT, which is currently being converted into a fully adaptive telescope. MUSE is the result of ten years of design and development by the MUSE consortium — headed by the Centre de Recherche Astrophysique de Lyon, France and the partner institutes Leibniz-Institut für Astrophysik Potsdam (AIP, Germany), Institut für Astrophysik Göttingen (IAG, Germany), Institute for Astronomy ETH Zurich (Switzerland), L'Institut de Recherche en Astrophysique et Planétologie (IRAP, France), Nederlandse Onderzoekschool voor de Astronomie (NOVA, the Netherlands) and ESO. Since the start of 2014, Bacon and the rest of the MUSE integration and commissioning team at Paranal have recorded the MUSE story in a series of blog posts which can be followed here. The team will present the first results from MUSE at the forthcoming 3D2014 workshop at ESO in Garching bei München, Germany.